As polls near, who will pay for government's ambitious promises? 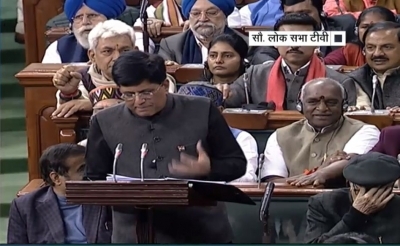 New Delhi, Feb 1 (IANS): All day, there has been talk after hearing Piyush Goyal's budget speech: where will the government get the money from to bankroll all its ambitious election promises? With four buckets turning into major recipients of government largesse - farm and rural economy, middle class, realty and housing and the unorganised sector - the government has to now find the corpus to pay for these schemes. The Modi government will take recourse to large dividend transfers by the Reserve Bank of India and PSUs to balance its Budget deficit after announcing a spate of populist measures ahead of the upcoming general election. The government estimates getting Rs 82,911 crore through dividend from banks, financial institutions and the RBI in 2019-20, according to the Budget document. Even in the ongoing fiscal, it estimates getting Rs 74,140 crore, much higher than the budget estimate of Rs 54,817 crore. In 2019-20, it is targeting Rs 53,200 crore as PSU dividend. The aggregate dividend transfers to the government this year would be some Rs 10,000 crore or about 20% less than the budgeted Rs 52,500 crore. However, the government is keeping the pressure on some of these companies to buy back their shares as its disinvestment revenue is faltering. The government may raise anywhere between Rs 12,000 crore and Rs 20,000 crore through the CPSE buyback route this fiscal, according to sources privy to the discussions, with ONGC being the latest in the line to stand up. Department of Economic Affairs Secretary Subhash Chandra Garg said after the Finance Minister presented the Budget that the government expects Rs 28,000 crore more from the central bank as an interim dividend. The RBI had paid Rs 40,000 dividend in August last year. The additional demand comes as the revenue from the Goods and Services Tax, for most part of the year, has lagged the Rs 1 lakh crore monthly target. Moreover, the government's planned stake sales in state-run firms are still short of the target, even though Finance Minister Piyush Goyal remains confident of exceeding the Rs 80,000-crore estimate. That leaves the government counting on the RBI to make up for the shortfall as it missed the fiscal deficit target for the second straight year. The government typically uses dividends from state-run dividends from state-run firms, financial institutions and the RBI to fund its additional expenditure. It has pegged such dividends at Rs 1.36 lakh crore in 2019-20. That's a 14 per cent rise from an already elevated dividend collection of Rs 1.19 lakh crore in 2018-19. Title : As polls near, who will pay for government's ambitious promises?